Southern as Biscuits: It's National Buttermilk Biscuit Day! It's National Buttermilk Biscuit Day! Wait a minute! 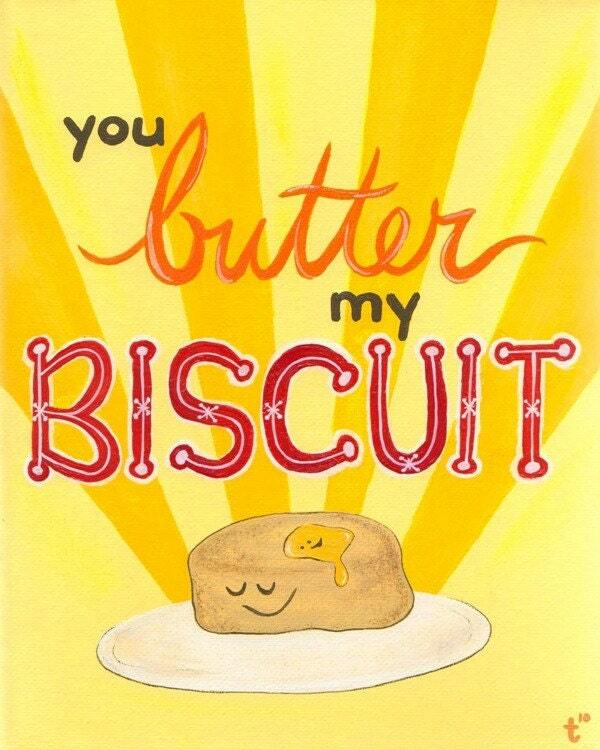 I just found out that today, May 14th, is National Buttermilk Biscuit Day! Time to celebrate the biscuit. Whether you use a recipe passed down through generations, or follow directions on the back of the Bisquick box, eat them hot with butter fresh from the oven, under poached eggs brunch-style, or cover them with strawberries and cream, biscuits are gravy, baby. Now I have to change up all my Etsy! To celebrate, I'm having a biscuit with fresh strawberries and whipped cream. Original Painting by Scatterbox Click the pic to buy. See my earlier Cat-Head Biscuits recipe post. Here is a recipe for Herbed Buttermilk Biscuits from Wholefoods. Herbs add fresh flavor to these tender biscuits, infusing the dough and also the butter brushed over the biscuit tops. A lovely accompaniment for just about any soup. Preheat oven to 400°F. Melt 4 tablespoons butter with rosemary and thyme. Set aside to infuse. In the bowl of a food processor, pulse both flours with the sugar, baking powder, salt and soda. Dice remaining butter and add it to the flour. Pulse until mixture resembles coarse crumbs. Transfer mixture to a mixing bowl. (Alternatively, stir the ingredients together in a large mixing bowl. Using a pastry blender cut the butter into the flour mixture.) Stir in the sage leaves followed by the buttermilk. Line a baking sheet with parchment paper. Drop tablespoons of dough onto the sheet in 12 even mounds. Brush the tops with the herb butter, and if desired, sprinkle with a little sea salt. Bake the biscuits until golden brown and fragrant, 15 to 20 minutes. Cool on a wire rack for a minute or two before serving. You are most welcome! We love YeeHaw Industries. I have a T-shirt & my hubby went to a one of your letterpress seminars in NC a few years back. We have our own letterpress, but unfortunately don't put it to use often enough.